In a hierarchical society, your view of how things are can differ remarkably depending on your place in the social ranking. This means that what is a daily reality to some people (such as sexual harassment, police harassment, violence in one's community, in one's home) can sound like paranoid fantasies to those who don't experience such strife. In some cases, this apparent lack of awareness of how others must live may be feigned, but in many cases I suspect it's due to the normal human tendency to see one's own experiences as the norm. "It never happened to me" is a point-of-view whose absurdity is obvious but which can easily escape scrutiny when it's allowed to remain as an unexamined assumption. Pointing out these types of inequalities can prompt a defensive reaction ("not all men / cops / parents" and so on), but that doesn't mean the conversation doesn't need to happen. French cartoonist Emma raises issues of inequality within French society with humor and humanity, using short statements accompanied by disarmingly charming cartoons that point out the absurdities of some common social conventions and beliefs. Emma gained worldwide recognition through this blog entry, which explains why the issue of who does the housework is more complex than it might seem at first glance. 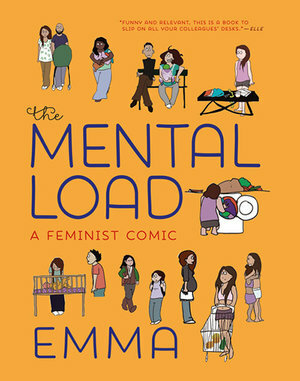 That article lends its title to a book collection of 12 of her comics: The Mental Load: A Feminist Comic, translated by Una Dimitrijevic. In this volume, Emma discusses a wide variety of issues, from her experience of childbearing to the deaths of nonwhite French men in police custody to the very nature of capitalism. She's not inclined to accept things the way they are, and whether or not you are convinced by her arguments, at least after reading her work you will be aware of some assumptions behind the official version of how things are and you will be made aware that alternatives exist. The title comic encapsulates Emma's technique perfectly. The topic is household labor (cooking, cleaning, childcare, and so on) and she begins with an anecdote about visiting a friend who was overwhelmed by trying to cook dinner while also caring for two children. The friend's husband, meanwhile, is enjoying a glass of wine and a chat with the author. When a pot on the stove overflows, the husband responds with criticism, then claims that he would have been happy to help—if only she had asked him. Emma goes on to analyze the assumptions that lay behind this scene, which has no doubt played out many times in households around the world. As she sees it, wives are expected not only to do most of the housework but also to organize it, giving them two jobs to do (in addition to whatever work women may perform outside the home). On the other hand, husbands are allowed to play the role of a child who may be asked to do a household task but would never be expected to simply see that it needed to be done -- and then do it. 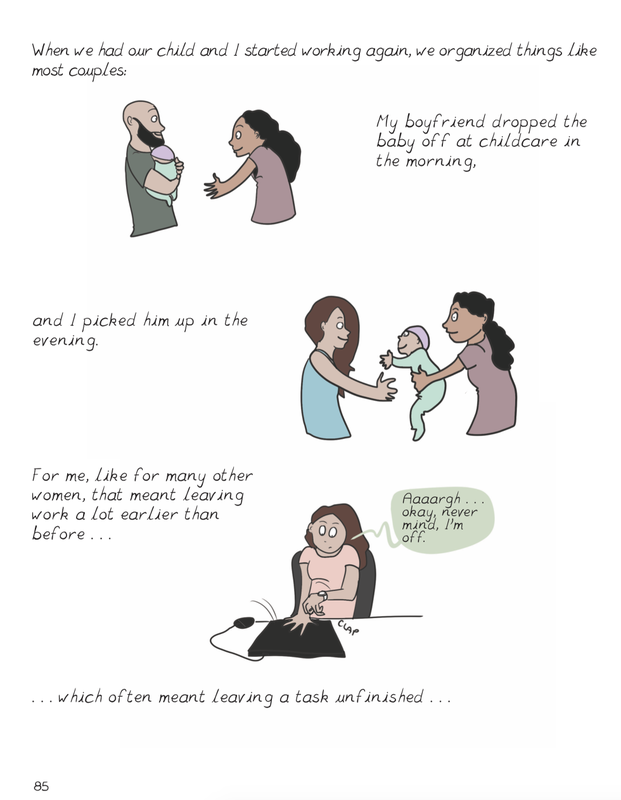 This organizing work is exhausting and never-ending, and the fact that it's largely unacknowledged is the product of a social system in which the burden of housework and childcare is primarily considered a female responsibility, while men are allowed to put their primary energies into their careers and/or other interests. This results not only in exhausted, exasperated women, but also in higher incomes and more career advancement for men. Another comic, "The Wonderful Tale of Mohamed", tells the story of an Egyptian man who became a victim of police violence during the state of emergency declared after the 2015 terrorist attacks in Paris. I won't spoil the story, but suffice it to say that the events described will ring true to many nonwhite (and underprivileged white) people in the United States, and underlines how, for some people, your life can be ruined by a series of events in which you did absolutely nothing wrong. 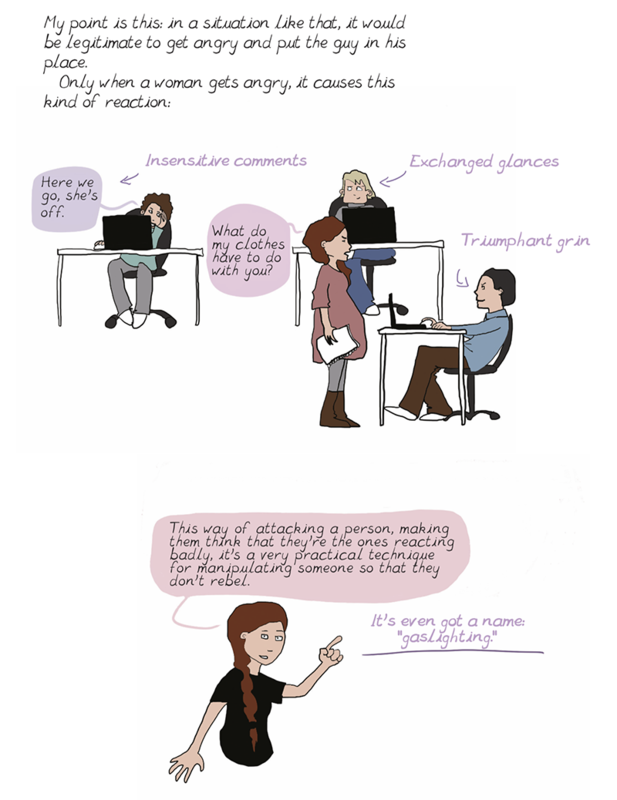 Emma's art is different in this comic—simpler, with the characters portrayed as stick figures rather than the fully-painted, semi-realistic people who inhabit her other comics—perhaps as a way of indicating that the story she's telling in this comic is not based on her personal experience. Despite the shift in style, her art in this comic is effective, and helps bring the terrible events being narrated to the fore. Reading Mental Load is rather like reading a chain of Twitter threads accompanied by illustrations. I mean that in the most positive way possible because I love Twitter threads. (Between you and me and the gatepost, I think the paragraph form is highly overrated and hardly the only legitimate way to present and develop an argument. When you are speaking obvious truths, burying them in a sea of prose tends to obscure rather than amplify them.) Emma combines personal experience with the testimony of others, sometimes citing academic research as well. In her comics, based on matters that are likely to be in the public record, there's enough information for you to research the subject yourself, should you be so inclined.